By Ashutosh KS in Desktop. Updated on December 9, 2017 . Windows 10 may have been a free upgrade, however, it comes with ads pushed to the system using different avenues (even if you’ve upgraded for a fee, sadly). These ads appear at various places including Start menu, Action Center, Cortana as well as on the lock screen. These ads coax you to buy apps and services that you may or may not need. Owing to the fact mentioned, many users find these ads intrusive enough to degrade the overall user experience. Fortunately, there exist some useful tricks to disable or block most of the advertisements and that’s what we’re going to discuss in this article. Below is a list of places where ads are shown and the tricks to disable them safely. Are you ready? Let’s disable ads. Open "Settings", click "Privacy" and select "General". Under "Change privacy options", toggle off the option "Let apps use my advertising ID for experiences across apps". 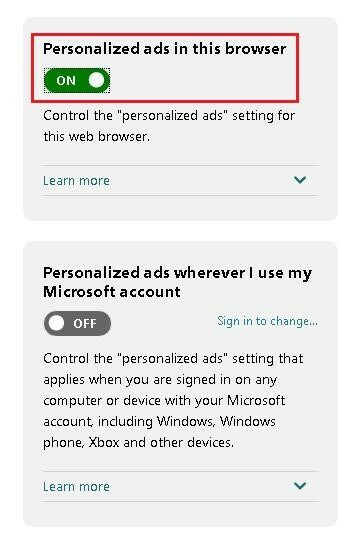 Toggle off the options named "Personalized ads in this browser" and "Personalized ads wherever I use my Microsoft account". Open "Settings", choose "Personalization" and click on the "Start" option. Toggle off "Occasionally show suggestions in Start". 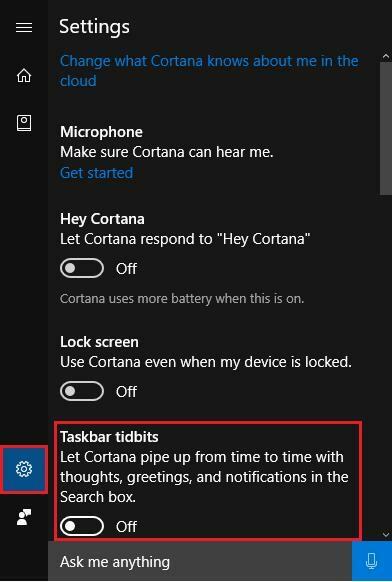 Open "Cortana", click on the "Settings" icon and toggle off "Turn off the Taskbar tidbits". Open "Settings", click on "System" > and select "Notifications & actions". 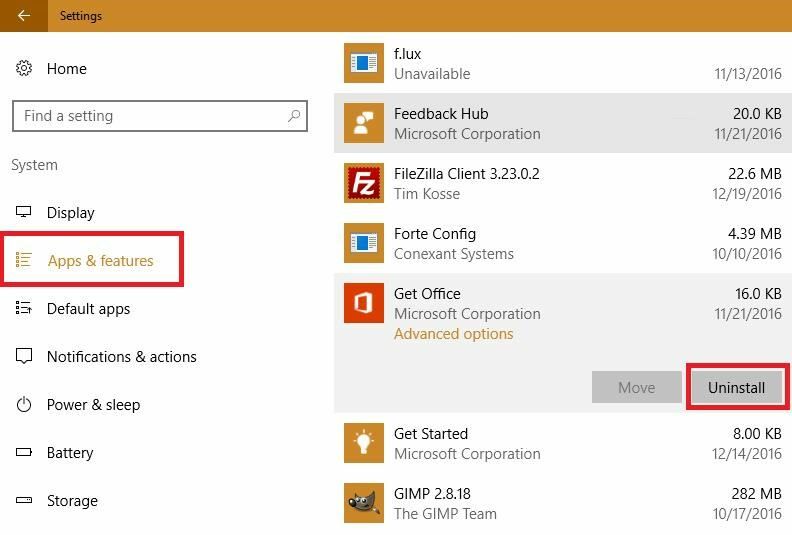 Toggle off "Get tips, tricks, and suggestions as you use Windows". The lock screen is a security screen that helps protect your PC from unauthorized access. It asks for your password when the PC is left inactive or goes to sleep or is turned on. Windows uses this screen to display ads when using its Spotlight, custom background or slideshow and shows tips, suggestions and more from Cortana and Windows. Open "Settings", choose "Personalization" and click on "Lock screen". In "Background" drop-down, select "Picture" or "Slideshow". 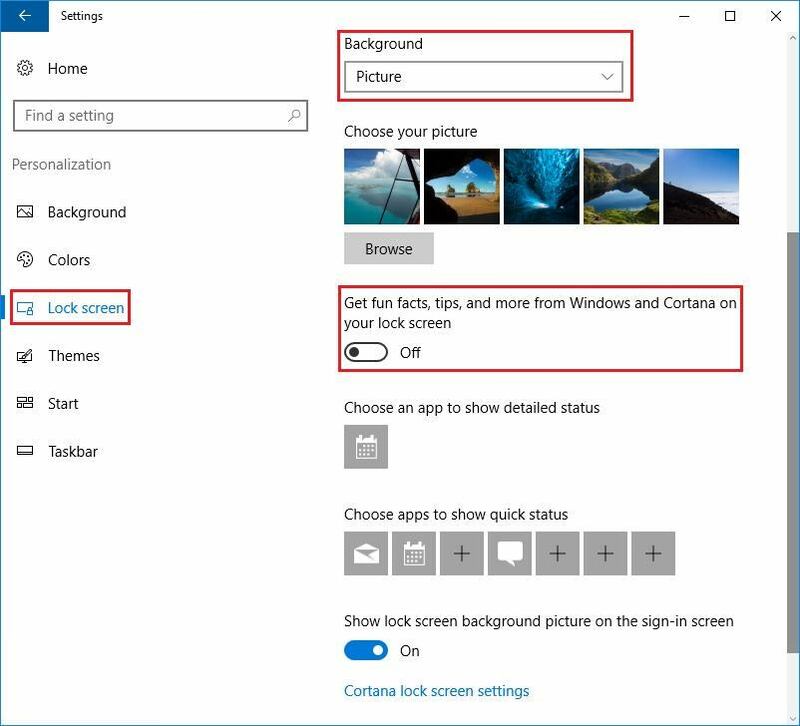 Toggle off the option "Get fun facts, tips, and more from Windows and Cortana on your lock screen". 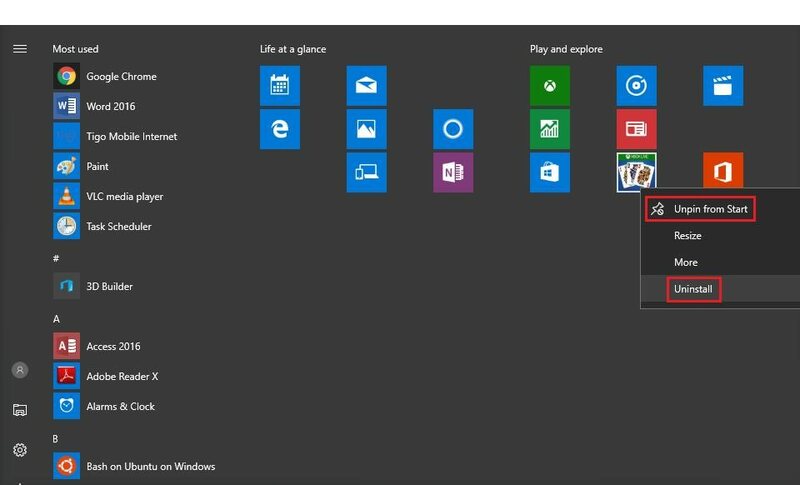 Open "Start" menu and "Right-click" the ad tile. Select "Uninstall" and click on "Uninstall" again. Note: Some tiles are just ads (and not apps), so select "Unpin from Start" to remove them. 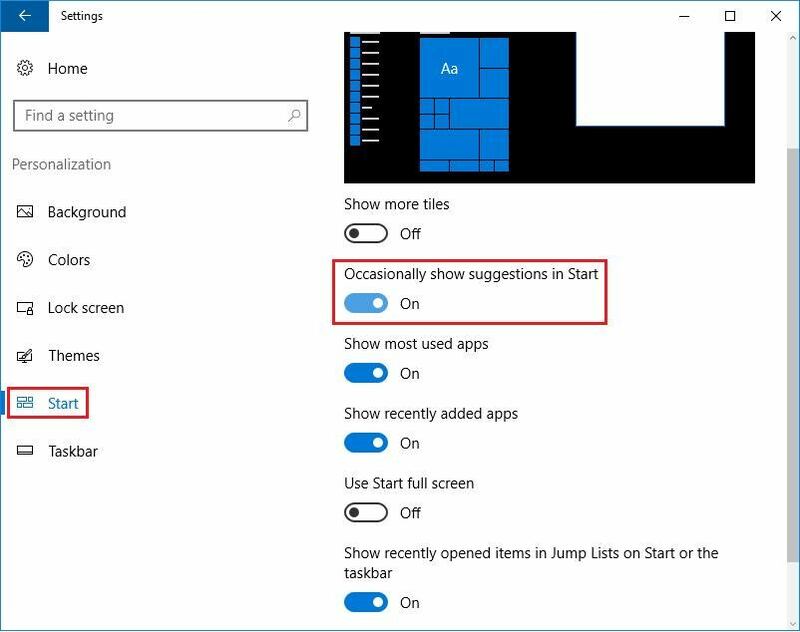 Open "Start" menu, right-click a live tile and select "More". 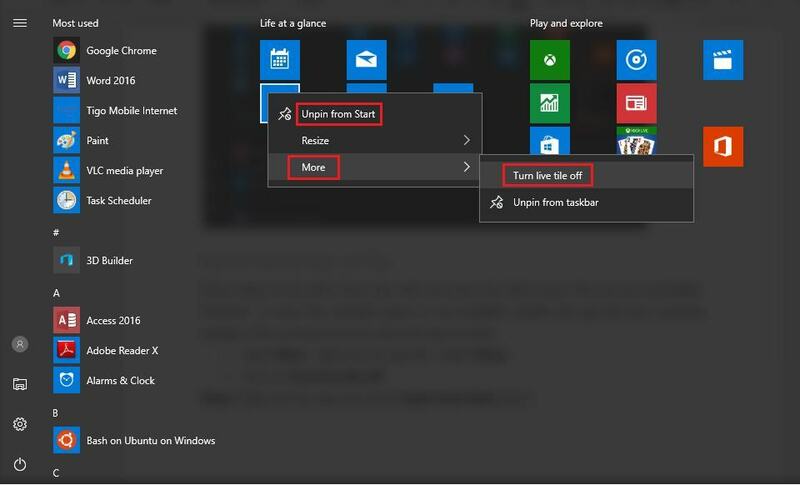 Click on "Turn live tile off". Note: Another option is to right-click the app and select "Unpin from Start" option. There are various apps pre-installed with the Windows 10 that just show ads or lures you to try out new apps or features. Moreover, you may also download apps from Windows Store that pushes ads in the Action Center or shows ads while using them. If you wish to uninstall all such apps and other unwanted apps once and for all, then follow the below steps. Open "Settings", select "System" and click "Apps & features". Click on the apps you wish to remove by clicking on the "Uninstall" button. Note: Some pre-installed apps like Windows Store, Xbox, Groove Music and Movies & TV are restricted apps that you can’t remove or uninstall by yourself. Some of the apps that you can safely remove in Windows 10 are the following: 3D Builder, App Installer, Feedback Hub, Get Office, Get Started, Microsoft OneDrive (in case you don’t use it), Microsoft Solitaire Collection (if you’re not fond of this game), News, Paid Wi-Fi & Cellular, Skype Preview (if it’s of no use to you), etc. 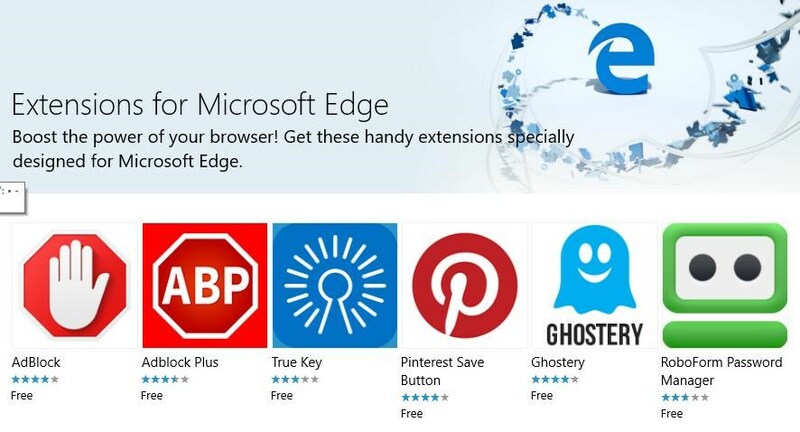 Windows 10 comes with a brand new web browser named Microsoft Edge that may show Microsoft or Bing-powered ads while browsing web pages. If you’re running the Windows 10 Anniversary Update, you can install a popular Adblock extension from the Windows Store. Here’s a list of extensions (including ad blocker) that you can install in your browser. Open "Settings", click "Devices" and select "Pen & Windows Ink". Toggle off "Show recommended app suggestions". 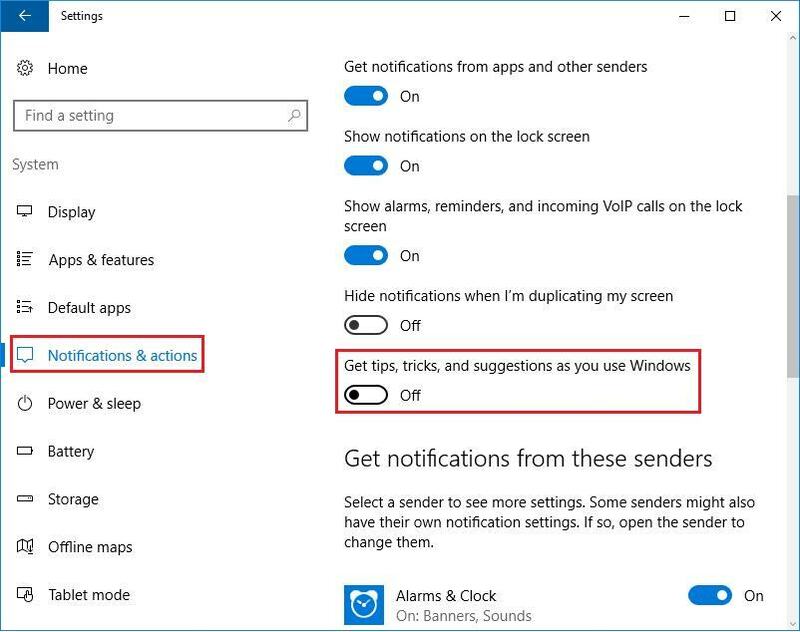 Note: These settings may or may not be visible on your system depending on the Windows 10’s release and the hardware present on your device. 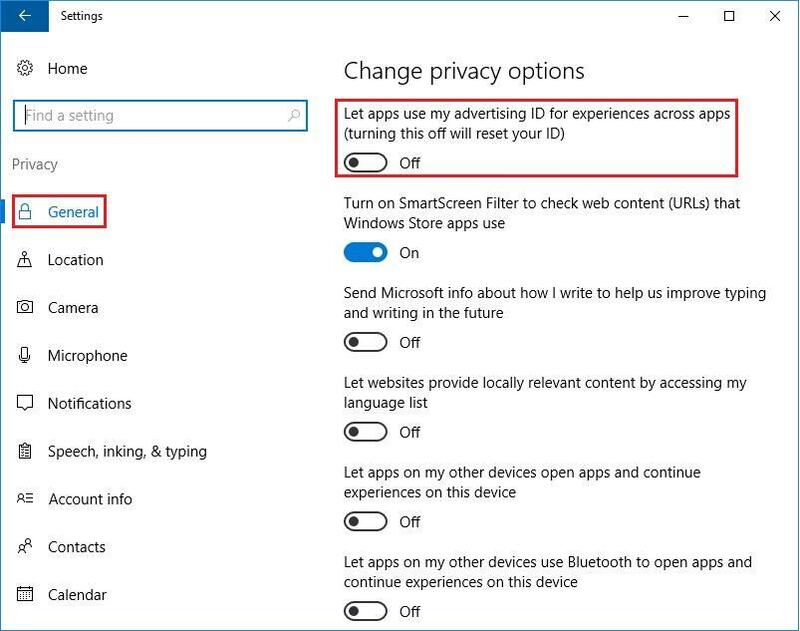 After disabling the options given in the above guide, the advertisements shown throughout the Windows 10 will significantly reduce on your system. However, these options don’t remove advertisements on the ad-supported apps and there is no option to disable them. We hope you were able to achieve an ad-free environment in Windows 10 using the above tricks and if you know any more such tips, then don’t hesitate to reach to us. Also, please share what you think about Microsoft’s advertising spree on Windows 10.